One of the BIGGEST challenges you have is getting more customers. The good news is that the internet has made this much easier. The bad news is that it is easier for your competitors too. If you follow this guide and implement it you will be on par or better than your top competitors. By the way, if you want seven actions you can take now to get results right away–I recommend signing up for our free series on that here. This guide is a comprehensive walkthrough of current best practices around competing for new business on the internet. It will be kept up to date, so bookmark it now. I’m going to charge through step-by-step, so that by the time you’re done with this guide you’ll be miles ahead of your competition. Use the links in the box to the right to navigate. The opportunity here is enormous. Even highly-competitive niches have large players who are missing basic parts of the right strategy. They have typically been sold a nice website by a web design firm that lacks depth and expertise in the most critical aspects of internet competition. Our goal here is to pull aside the curtain and show exactly what is needed. I want this resource to give you more and better information than what you’ve paid hundreds or thousands of dollars for in the past. Why would we do that? Because our business exists to serve yours. You can do this. Whether you implement everything in here yourself or hire a professional to help (like us) our mission is accomplished. We measure success at our firm by providing value far in excess of cost. To that end, we will cover in this guide a tremendous number of resources for you to check out and use. Don’t worry about keeping track of them as they are mentioned in the text. Instead, head over to the Heaviside Group Resources Area for quick links to all of them and reminders of how to use them and what they are for. Before we dig in, here is a very general synopsis of the ground we will cover together. Perhaps not surprisingly, it all surrounds your website. This is your most important real estate online, and we will spend a great deal of time on this. Once we have the website built properly, we will cover how to best use it as a lead generation tool. If you think a website is just an online brochure, it’s time for that to change. It’s going to become your #1 salesperson. Once your website is “good enough” we’ll dive into bringing traffic in. Finally we will cover a secret weapon that is far underappreciated as of this writing: how to manage your reputation online to the benefit of your business. If you’ve had some malcontents slam your business with unfair and false reviews, we are going to fix that. This applies whether you have a website in place already or if you are just starting out. If you already have a site, I recommend you begin by taking a second look at “where it lives.” If you don’t have a site yet, then you’ll need to figure this out. Choosing where your site lives can be tricky, as there are numerous options of various cost. There are options that “make it easier” for you, but you’re trading control of content/structure for a monthly premium. Places like Wix and Weebly will cost you around $25 per month or more. You can go that route if you wish, but I don’t recommend it and this guide will assume you don’t. Let me give you an example of what can go wrong. This was first written before the April 21, 2015 Google Mobile-Friendly update. I found numerous YP (that’s Yellow Pages, of course) websites that failed Google’s testing tool. Those sites had their rankings damaged when that update hit. What recourse did those site owners have? None. They are paying a premium monthly cost for their site, and it’s not even mobile-friendly. No thanks! I want maximum control of my websites, because in order to create the most effective site you must be able to alter subtle but important aspects of the pages. With “easier” solutions you trade away some critical access. Since you’re reading this guide, you don’t need the easy solution. You have the correct solution in your hands, and we’re going to walk through it together. If you’re already familiar with this topic, I’ll give you my preference here: Bluehost hosting, with the website built on the WordPress platform. I find it to be the optimal solution: low cost but still easy enough. There are a ton of choices here, and most will do just fine. I’ve used Hostgator before, and Dreamhost, and Bluehost. Arxive and GoDaddy should be fine too. For our purposes this is really a Coke vs Pepsi thing. People have their preferences but at the end of the day it’s just a cola with slightly different flavoring. We’re talking about shared hosting here. When you get to the point where serious performance matters you’re going VPS or dedicated anyway. 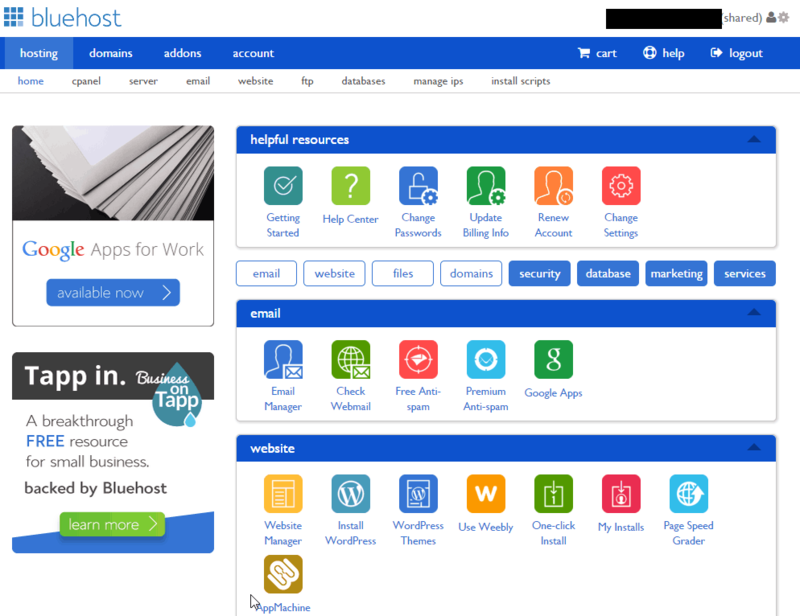 I recommend Bluehost to clients, as I find it to be easy to use and quick to set up. [Note: most links will take you to my resources page. That page is maintained and updated, and will always have the most current info.] Whatever you choose, you should only be paying around $4-5 per month. Don’t add on the extra features—you don’t need them. Anything you’d be adding we will cover here in more depth and of greater quality. The bottom line is, don’t overpay for this. If it’s costing you more you have features you don’t need (yet). Also, make sure you have your domain ready when you go to sign up. If you have an existing site moving it gets rather technical and is really beyond the scope of what we can cover here. This is something I don’t recommend you tackle yourself unless you already have the technical know-how. There are a lot of things that can go wrong and you can easily break something. It’s probably not worth investing the time to learn it, pay someone to do it for you. If you’re not sure of the value of doing this yet, keep reading. Once you see where we are going with this, it’ll be easier to make that call. You may already have www.yoursitename.com figured out, or have an existing site. If you have an existing site, do not change the name. You’ve built up ranking equity in the search engines and it will make bringing traffic in later easier. If you’re just starting out and need to pick a name, a few pointers here. Stick to .com. Not only do search engines seem to favor those domains, but your customers do too. 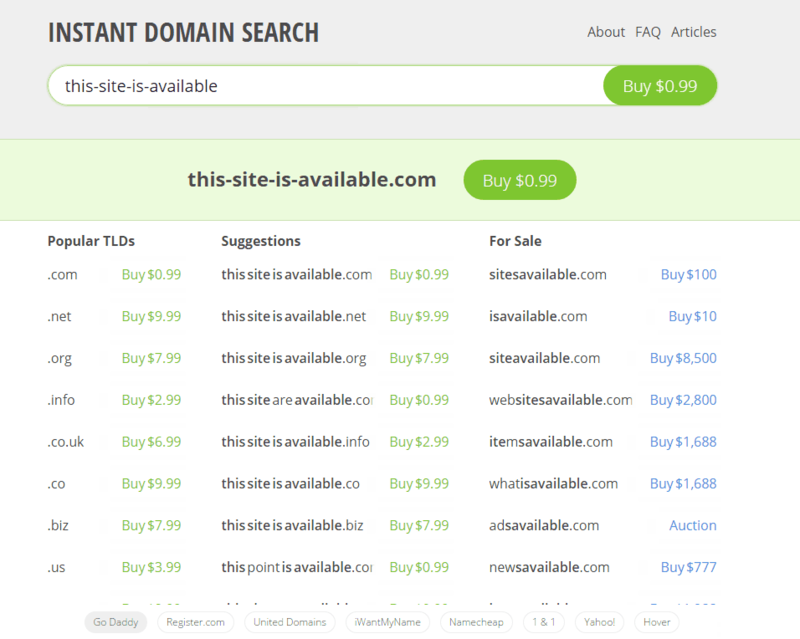 Check availability using a site like www.instantdomainsearch.com. I use this because it lets me see if what I am looking for is available as I type it in. If it tells me I can buy it for $0.99 I know it is available. Don’t buy it yet here, you’ll want to register it for free when you sign up for your hosting account. Very key point here: don’t buy an “exact match domain.” If you’ve worked with SEO providers in the last few years you may have been advised to buy something like yourcitiesbestlawyer.com. This is a perfect example of bad SEO advice. This used to work like a charm to get a site ranked, and still does to some extent, but it’s a dangerous method. Google does not like EMDs and they clearly seem to have been devalued in the rankings. That will only continue as Google and the other search engines seek to promote the highest quality content. You should be using your brand as your domain, period. 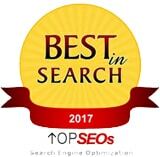 There are far better SEO tactics that give much better results that will stick through algorithm updates. Searchmetrics does an excellent annual study of this—check their report to see what is working and what is not. Once you have your domain chosen, go ahead and set up your hosting account. If you’re ready, click here to go to my resources page. The links there will have the most up to date deals as well. One other note: the only option you may consider selecting is domain privacy. For an existing service business, there really is no need for this. If you really want your company info cloaked from a whois query, by all means go for it. 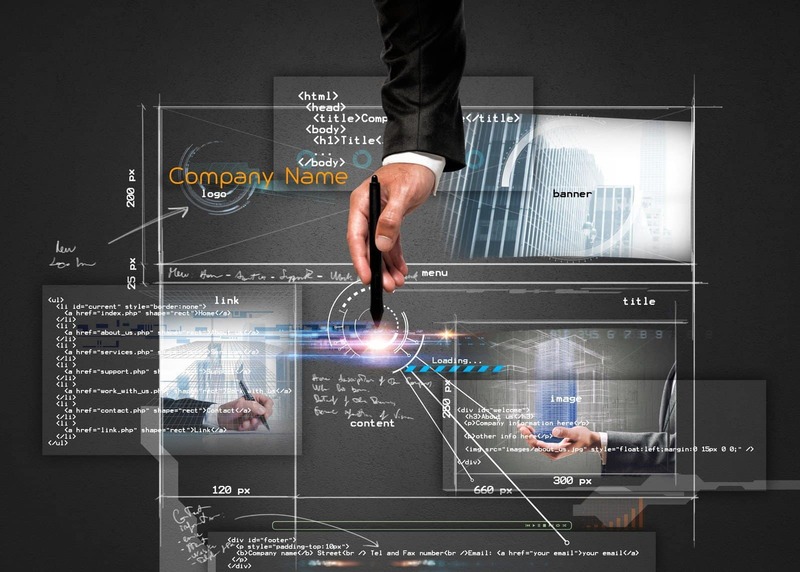 The most common approach to website building today is using a Content Management System (CMS). An unfortunate strategy of some website design firms is to use a private CMS which locks you into their platform. Good luck getting your site and content out of their grasp. Stay far away from this. There is no advantage, and you lose fundamental control of your website. It’s even worse when you spend an enormous amount of capital having a great site built that is now stuck there. You’ll have to pay all over again to get it back. If you’re going to outsource this, hire a firm that will build your website on WordPress, Joomla, or Drupal–or at least explain your options to you. Those three are by far the most common, and you get an asset built that you retain control of. Some of the biggest brands in the world use these platforms: Best Buy, Xerox, New York Times, Sony Music, Fortune, and Time all use WordPress, among many, many other companies. 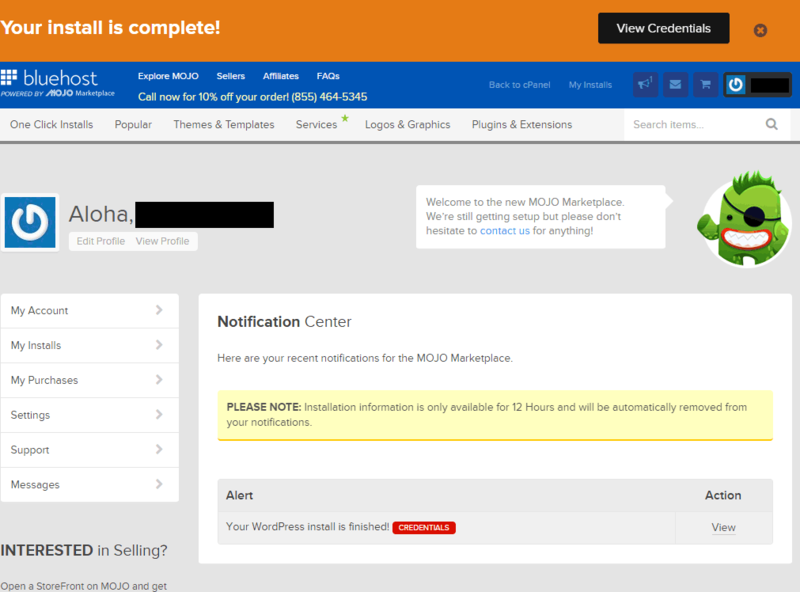 We almost always use WordPress on our own and client sites. It’s the easiest to use and can be used to build just about any functionality you imagine. It is very unlikely that you need a custom website built outside of a CMS. If Best Buy can run their Ecommerce through a WordPress site you can too. Now that you have signed up for your hosting account and registered your domain name it’s time to get your CMS installed. 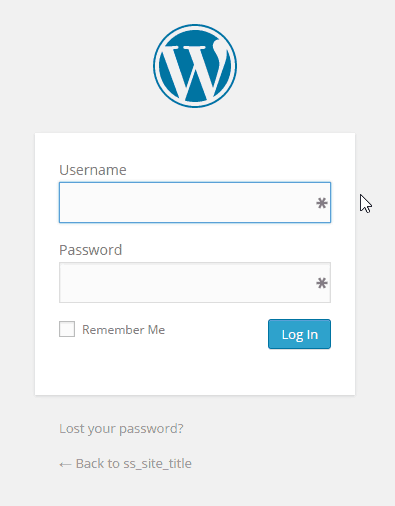 If you’re following along and have chosen Bluehost and WordPress, then this part is going to be nice and easy for you. 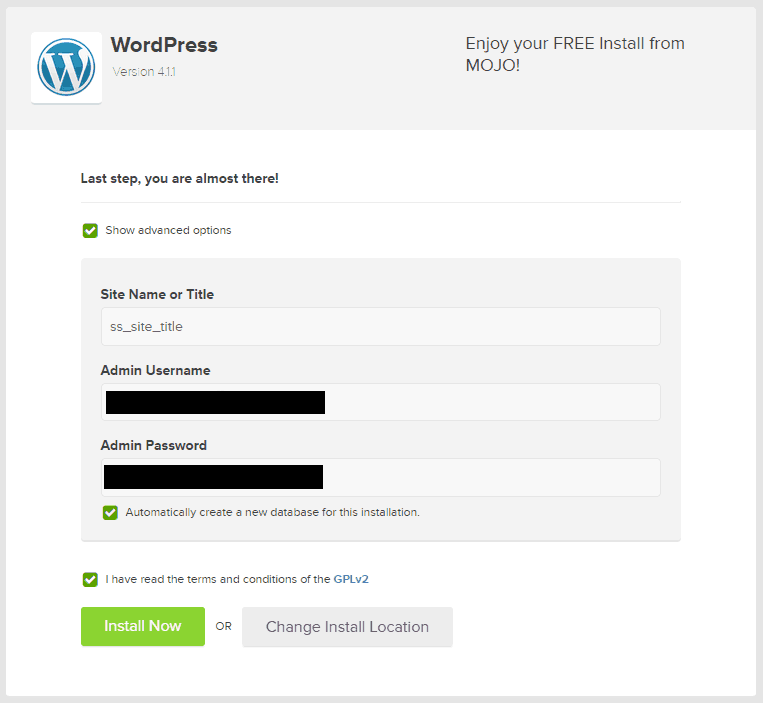 The steps should be similar on other hosts for installing WordPress. 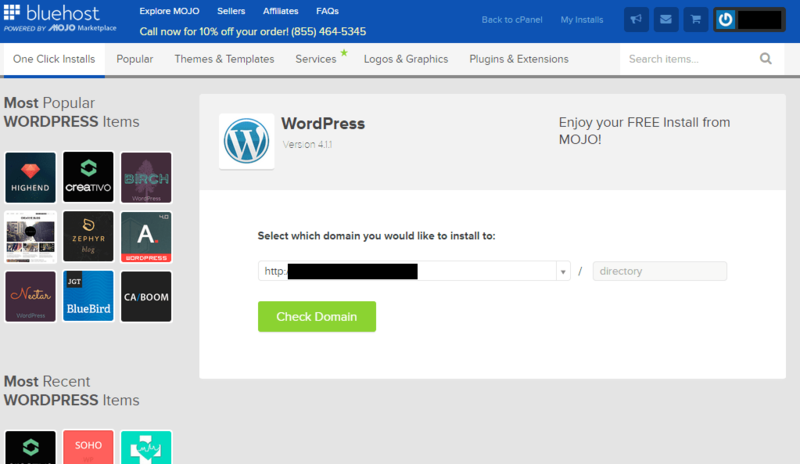 Go ahead and click on “Install WordPress.” You’ll be taken to a screen where you can choose a Free Installation or Paid. By the way, I’m blacking out the domain because this is an actual “niche” site I am about to create that I am doing this installation on, and I don’t want to reveal the site. Click “Check Domain” to proceed. Call the site whatever you want that is short and relevant. This doesn’t really matter, as it can be changed. Your admin username will default to the email address you used to set up your hosting account, and the admin password will be randomly-generated. Write these down and store them where you keep passwords. I don’t recommend changing the password unless you make it more secure than the default. If you’re not sure what that means, then leave it alone. 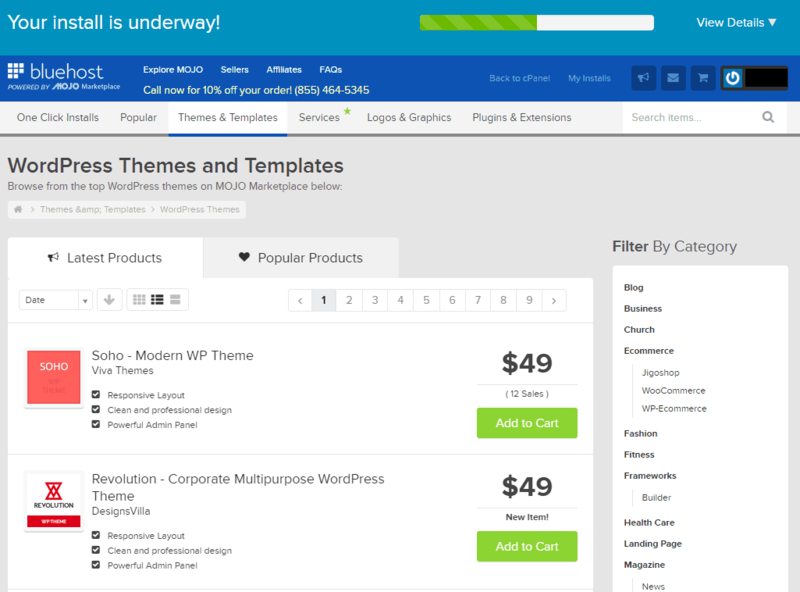 You can ignore the $49 themes shown, and once your information is recorded you can close this site. Now we’re going to head over to your WordPress Admin address and log in. Type in your admin username and password, and log in. You’ll see the WordPress interface. Now that you have WordPress installed it’s time to select your theme. There are tons of free ones available. Hover over “Appearance” in the column on the left and select “Themes.” Then, select “Add New” and then “Browse” to see available options. You can look through these and try different ones if you’d like. I’ve tried dozens of themes. Ultimately, I’ve settled on X-Theme for my own site and most client sites as well. If we’re not making a custom theme for our client X-Theme is it. Head on over to the resources page for a link to check it out. Before activating the theme, I like to install a few plugins. 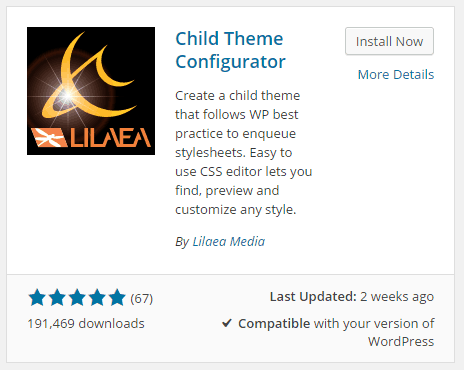 The first plugin you should install in any WordPress installation is a “child theme” maker. This is because you will likely want to make modifications to the template—for example, removing the “Powered by WordPress” or other such branding in the footer. If you were to make those changes to the original (i.e. “parent”) theme, you would have to redo them every time there was an update to that theme. Most good themes are actively developed and updates are frequent. A child theme is a nice solution to this problem. It is basically an extension of the parent that inherits all of its traits, but anything customized in the child theme replaces what is in the parent. So when the parent is updated, your child is updated without writing over your customizations. You should always create a child theme, even if you don’t anticipate a lot of customization. If nothing else the theme branding needs to be replaced with your own, and that’s reason enough. Let’s get it set up. Search for “google tag manager” and install and activate DuracellTomi’s Google Tag Manager for WordPress. Then, search for “yoast” and install and activate WordPress SEO by Yoast. This is the end of part one. Next up we will get our analytics and tracking properties set up and installed and get the site designed.